UPDATE – Eric O’Brien has rightly pulled me up in the Comments section below on my failure to mention Slow Play. He is absolutely right. There were some players who were very slow and the R&A / USGA referees failed to punish them. I know this was the Walker Cup and it was important but unless the matter is addressed in high profile events like this how will this problem in our game ever start to be eradicated. Who would have predicted a 16.5 – 9.5 victory for Great Britain & Ireland (GB&I). Perhaps just Captain Nigel Edwards in his wildest dreams ? The record breaking win was a magnificent achievement for Nigel and all of his players. The GB&I performance was particularly pleasing as they were up against a strong USA team – at least on paper and we now know preferably playing on parkland courses back home. The GB&I players performed superbly to a man and the final results made something of a mockery of the world rankings. 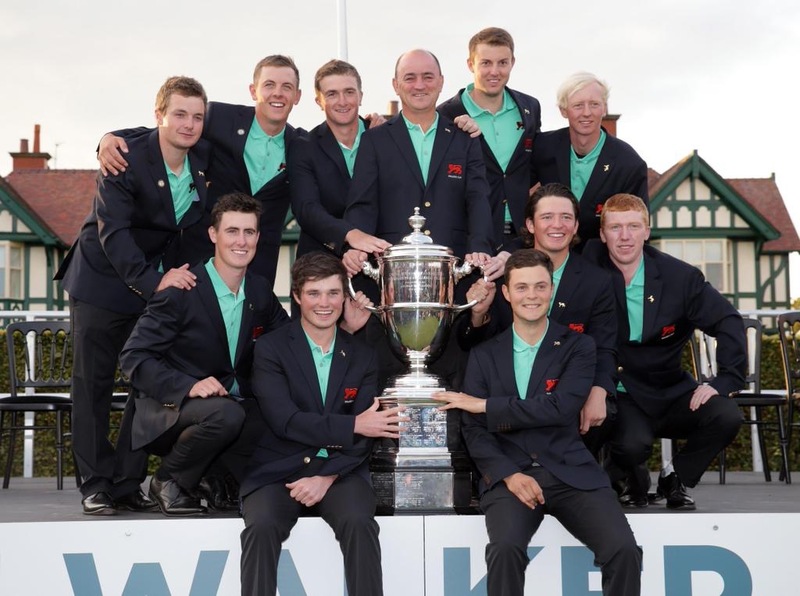 The detailed 2015 Walker Cup results can be reviewed here – Walker Cup Results. The overall standard of golf that I saw was very high – these guys can really play. As we all know the team that chips and putts best normally wins these competitions. This weekend GB&I outplayed USA but particularly with these scoring shots. As such few holes were conceded softly and victories were therefore frequent on a tough course where the green surrounds are undulating and scattered with deep bunkers. It was great to see all ten members of the GB&I team contributing at least a point to the total. Ahead of the match all the talk was of Ireland’s ‘famous five’ but it was England’s Ashley Chesters and Jimmy Mullen that shone brightest. A rock solid foursomes partnership delivered under pressure and set the foundation for a comprehensive team win. Perhaps helped by being under the radar a little, albeit exposed by being sent out towards the top of the order in each series, Jimmy secured 4 points out of 4 whilst Ashley achieved 3.5 out of 4. Having said that Ashley’s dropped half came against Bryson DeChambeau – who denied him with a golfing near miracle on the 18th on Saturday afternoon – and any points taken from him during the match were always going to be a bonus. The two Sterling University players really impressed me at Lytham and perhaps demonstrated better than anyone else on the team what made GB&I so strong this year. It was clear they got on well and had played golf together many times before this match started. Their personalities dovetailed as well as their foursomes play. The calmer McDonald who played with a smile on his face counter-balancing the outwardly more hyper and focussed Sharvin. To say Sharvin was ‘up for it’ would be an understatement from what I saw. Ewen’s non-selection then selection must have been difficult for him but he got on with it and contributed fully to the team both on and off the course. He played three of the most memorable shots of the competition too – his drive on the par 4th 16th on Saturday, his final putt on 18 on Saturday (video 1) and then his superb chip-in on 17 on Sunday (video 2). I was stood right in front of him when he played the chip and it’s fair to say that some of his mates from Glasgow and myself briefly lowered the tone of the event. Without wishing to take anything away from the GB&I Team’s superb performance, Jordan Niebrugge (0/3), Denny McCarthy (1/4), Maverick McNealy (0.5/3), Lee McCoy (0.5/3) and Hunter Stewart (1/4) all under-performed. All of them came with big reputations but left with them tarnished. The biggest surprise was perhaps Niebrugge, who starred in the recent Open Championship, but struggled badly at Lytham. I watched quite a bit of Mike McCoy (52) and Scott Harvey (37) and unsurprisingly they were both very good golfers. Their problem is golf is increasingly a young person’s sport at the highest level. They were expected to be a weak link in the USA Team and they didn’t disappoint – McCoy securing no points (0/3) and Harvey one (1/3), the latter a singles win over Grant Forrest. 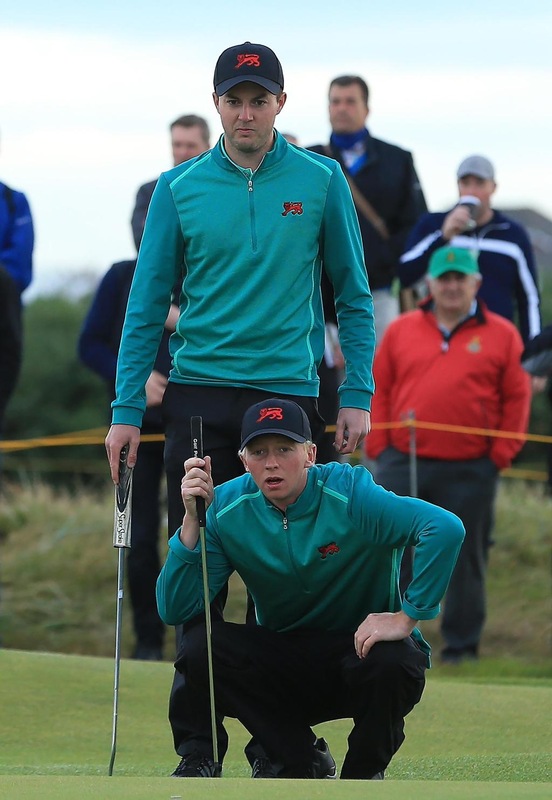 To be fair Sunday’s entrance fee was worth paying to see McCoy’s fist pump on the 16th green after he matched Hurley’s well celebrated birdie in their foursomes match. However, Harvey’s drive on the very next hole, way right onto the range, was critical to ending any hopes the USA had of turning the match around. I admire the USGA’s policy to some degree but perhaps just one mid-amateur would be sufficient to convey the message they wish to send out. It is easy to be critical of a losing captain after the event. I am also conscious that Mr. Miller (65), who was clearly a nice man, didn’t play any shots during the match and is said to have had no say on the team selected. However, there is no question in my mind that he contributed to the manner and extent of the USA’s defeat. His more relaxed approach to the match simply didn’t work – he wasn’t as visible as Edwards and appeared to lack the leadership and motivational skills required for the job. Sometimes the players don’t know what’s right and on those occasions firm guidance needs to be forthcoming from above. 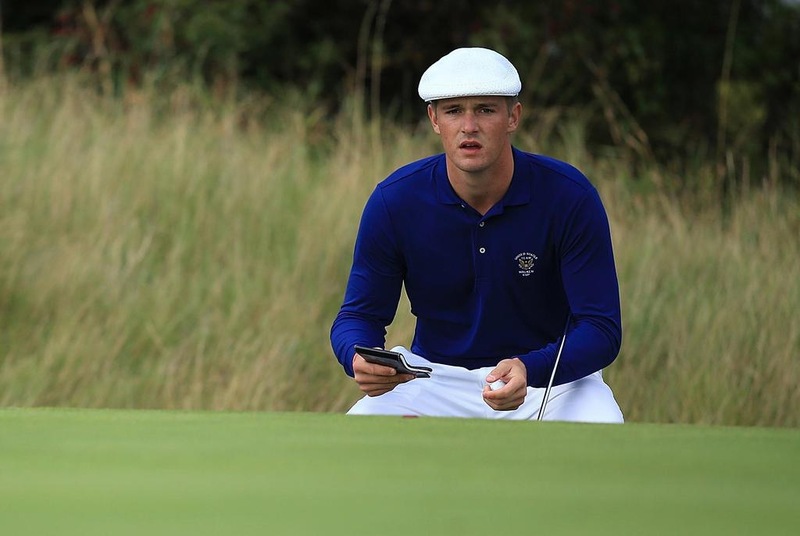 How could you not play Bryson DeChambeau in the Day 1 foursomes (even if he did tell you he had a sore neck) ? Was it not complacent to tell all the players in advance that they would play no less than three times ? Were the two mid-amateurs overplayed ? Who came up with the Day 2 Singles line up which even on Saturday evening clearly needed to be front-loaded ? Unfortunately for the USA they had a spider and we had a dragon at the heart of affairs. It will be interesting to see if he is retained by the USGA for 2017. There were many very good players on show at Lytham but one exceptional one in my opinion. It was not a surprise to see Bryson DeChambeau (2.5/3) impress at the Walker Cup after all he is the World Amateur No. 1 (SPWAR) after a stellar summer where he won both the NCAA and US Amateur Championships. He looked the part both physically (accepting the neck injury which must have quickly settled down) and mentally, had a real aura and clearly a lot of game. Like Tiger Woods and Jordan Spieth he will probably turn Pro next summer without a Walker Cup win on his resume but what a prospect. Beau Hossler, top points scorer for the USA, with three out of four, also impressed me. He helped shock star pairing Dunne and Hurley on the opening morning before going on to win both of his singles (Jimmy Mullen being the only other player to achieve that feat). Whilst not the blue eyed boy like Dechambeau there is a steely determination about Hossler which suggests his journey has equally only just begun. Hossler’s recovery from Ferguson’s ‘shot heard around the world’ (well most of Lancashire anyway) on 17 on Sunday was particularly notable. An approach over the bunkers on 18 to a tight back right pin that finished stone dead – not that Ferguson was rightly in any mood to concede it – to win the match was one of USA’s most memorable moments. He clearly didn’t enjoy the loss. I think the role of the Lytham Trophy and course knowledge may have been overstated as contributing factors to the victory. It clearly won’t have done any harm that some of the GB&I players had competed in the Lytham Trophy previously and attended a squad session at the course back in July. Additionally, their wider links experience will of course have been beneficial. However, with the exception of Gary Hurley and Jack McDonald most of the team either hadn’t played competitively or had poor form at Lytham. I guess the strength and direction of the wind changes the course’s playing characteristics from one day to the next anyway. The opposite is true of foursomes though. 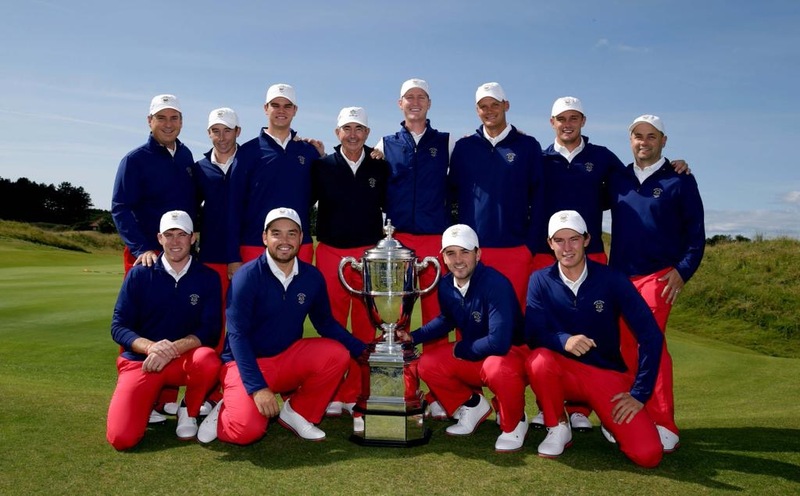 The US Walker Cup players always turn up with next to know experience of foursomes. It shouldn’t really matter but somehow it does. This means partnerships are unproven and the players are lacking in confidence in this format. GB&I’s team are used to the vagaries of foursomes having played it in both the Home Internationals and the European Amateur Team Championships. The players and selectors also have the benefit of seeing which partnerships work and which don’t well in advance of the Walker Cup. Foursomes is clearly a nice advantage for us. The course and members were a credit to this great Club. The bunkers, greens and run off areas in particular looked superb on the ground. I did overhear a member talk of a major course overhaul starting shortly with the removal of over 40 bunkers which will be interesting. A story to follow, if and when it happens, given the status of this much respected links. Watching golf live can be something of an expensive walk, albeit often a pleasant one. I had read many times before that the Walker Cup was golf’s best spectator event and I wasn’t disappointed when I attended on Sunday. It was great having access to the fairways and green frontages. Stewarding, undertaken mostly by Lytham members, was effective but relaxed ensuring all of the spectators enjoyed the match. Getting up close and personal with the players, both before and after play, certainly made up for only being able to be in one place at one time and therefore missing most of the action. The numbers were good but not overbearing so an atmosphere was created without one ever feeling hemmed in. 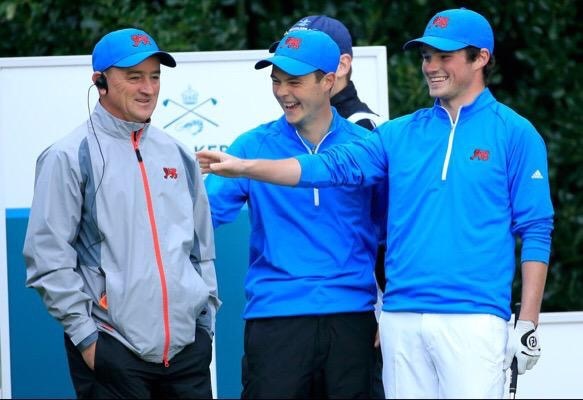 As you may have seen Peter Dawson undertook the starter duties at this year’s Walker Cup. Presumably one of his final duties for the R&A as he hands over the Chief Executive reins later this month to new CEO Martin Slumbers. As one would expect he performed the duties perfectly. I don’t know him at all but he strikes me as someone who is going to be missed a great deal and will be a hard act to follow. As I was walking around the sun drenched Lytham fairways on Sunday my mind drifted off to the golfing public’s awareness of the match. I asked myself what percentage of the UK golfing population even know this match is taking place now ? Low single digits I guessed to myself. What a shame and surely something we all must try to address. 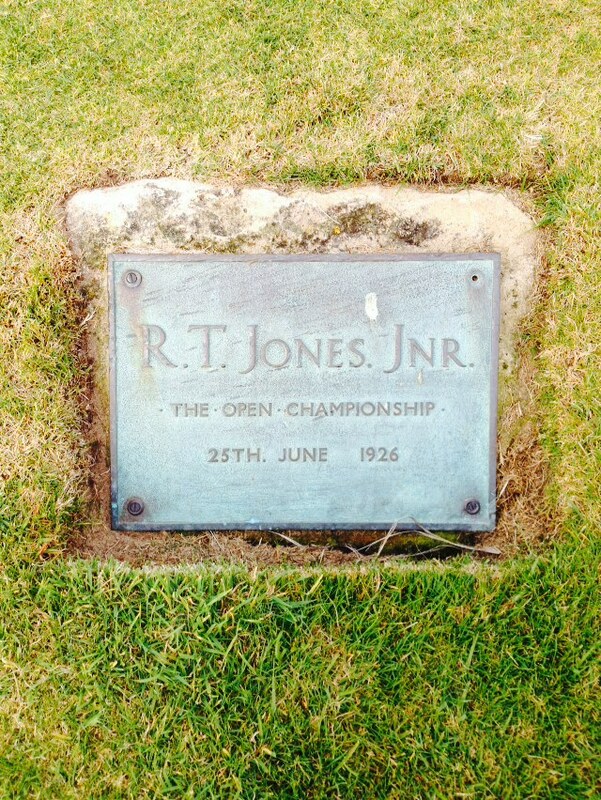 I certainly felt part of a special occasion and was pleased I’d made the effort to witness the final day of a memorable match at Royal Lytham in person. 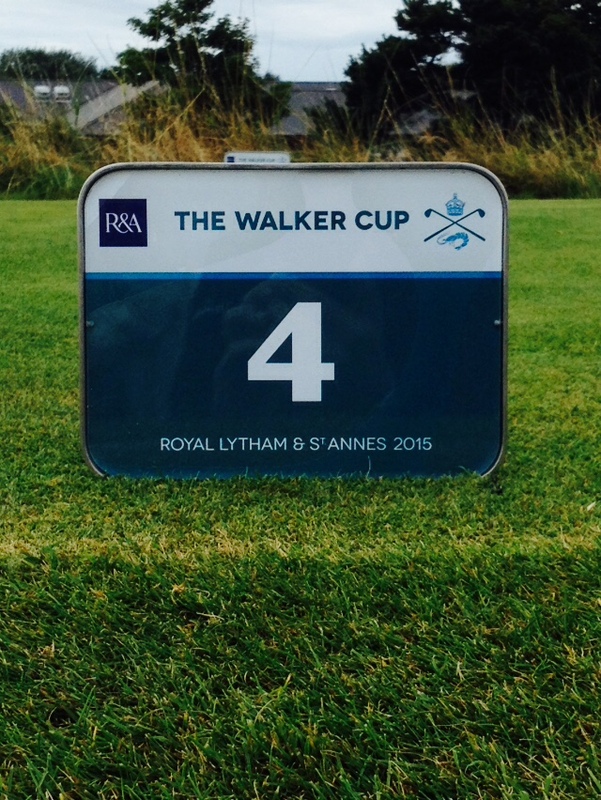 Having got the bug I am sure Lytham won’t be the last Walker Cup match I attend. I will certainly have few excuses for Royal Liverpool in 2019 which is even closer to home. However, as I was driving away from the Fylde Coast my mind turned to how I could persuade Mrs. GB that a trip to the West Coast of America in September 2017 would be nice for us. The ultra-exclusive Los Angeles Country Club in Beverley Hills – said to be amongst the most expensive golf real estate in the world – sounds right up my street. Rarely photographed or seen on television it’s North Course is meant to be something really special. Even more so following a sympathetic restoration by Gil Hanse and golf historian / blogger Geoff Shackleford in 2009-11. 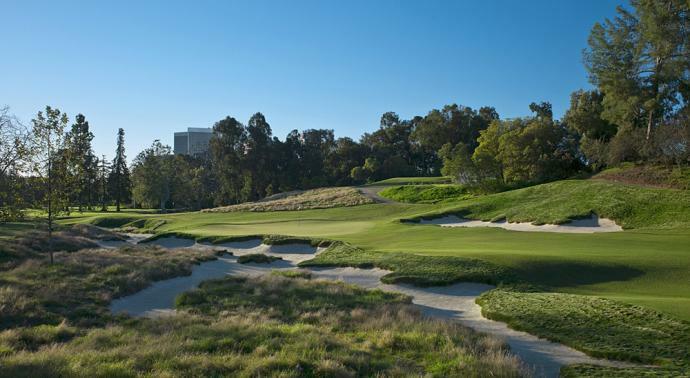 This has returned the course more closely to how George C. Thomas originally designed it in the 1920s. This August 2015 LA Times article on the project makes interesting reading too if you have the time. After a long courtship the USGA persuaded the Club to initially host the 2017 Walker Cup and more recently the 2023 US Open which whets the appetite even more for a long away trip. Even if I don’t get there the TV coverage should be good – Fox have the rights and I believe their HQ is only 1 mile down the road. Copyright © 2015, Mark Eley. All rights reserved. This entry was posted in Walker Cup and tagged Ashley Chesters, Beau Hossler, Bryson DeChambeau, Cormac Sharvin, Ewen Fergusson, Jack McDonald, Jimmy Mullen, Lytham Trophy, Nigel Edwards, Royal Lytham, Walker Cup. Bookmark the permalink. ← Does The Walker Cup Need A Refresh ? ME — Having attended my first Walker Cup in 1969 at Milwaukee,Wisconsin and being Irish, I am surprised and disappointed that you make no mention of the pace of play . Ashley Chesters set a great pace and good example but I was told Paul Dunne was warned for slow play 3 times. I noted on Sat.a.m. when Dunne and Hurley approached the 13th tee the match ahead — Ashley Chesters & co. were near 16 green. R&A ,and Home Unions need to introduce some timing machines every 3 or 4 holes !! If they are allowed use radar why do they also need to read yardage books ?? The decline in Golf’s popularity must be related to pace of play . Eric – thanks for your feedback. You are absolutely right and I should have mentioned this. Unsurprisingly I did notice how slow some players were, Paul Dunne being one of the most obvious culprits. This is an ongoing problem which as you rightly say both the R&A and Home Unions seem reluctant to properly address. Mark.